When you think of happy sparkly music there's no music as happy and sparkly as what's coming from the newly emerged star, Jojo Siwa! We knew she had the moves but who knew she had those pipes? Maybe you've been following Jojo since her days with Dance Moms. Maybe she got on your radar after her songs started kicking YouTube into gear. You have to admit that candy store song works like a pixie stick to the brain. So, maybe your little one is dressing up as Jojo this Halloween. Hey, maybe you are! 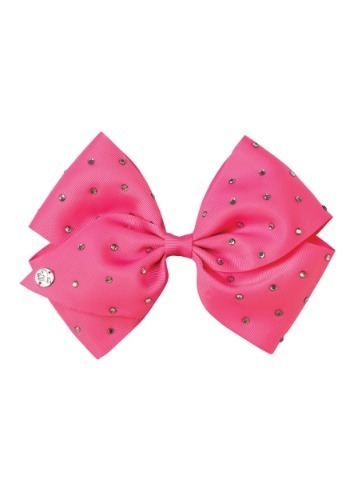 Either way, you simply can't hit the dance floor without Jojo's signature bow. The bright pink perfectly shows up her happy go lucky personality that's ready to "Boomerang" back from anything! And of course, a little sparkle doesn't hurt either. So, clip this big bow into your hair and don't forget to stretch because when it comes to dancing, Jojo never comes in second!